1. John H., m. July 12, 1838, Sarah H. Grisamore. 2. Jane, m. Thomas Henderson. 3. Samuel, m. Margaret Elliott. 4. Mary, m. _____ Gamble. 5. Harriett, m. _____ Weatherford. 6. Martha, m. Wesley Watson. 8. Joseph Knight, m. Fanny Steele. 1. Samantha, b. 1834, m. Judge Charles Pinkney Ferguson. Nellie and Frank died in childhood. Mary (or Mamie), m. _____ Johnston and lives in Jeffersonville. Margaret. This family moved to Tennessee. James, b. _____, m. first, Nancy Haven, m. second, Hetty Jarmegan. William E., lawyer and judge, m. Flora McCampbell. Mary II, m. William A. McCampbell; Mary died and he m. second, Sallie Caldwell. Margaret, m. Bennet McCampbell (son of John McCampbell). "Isaac was licensed to preach the Gospel by the Presbytery of Union, April 8, 1802, and married Flora McCampbell. He established Maryville College, Tennessee. Was a grand man, educated, clothed, fed and sent out into the world 27 ministers-- Indians (I am told)." All of this family moved to Tennessee. Recorded at court house, Shelbyville, KY.; William Anderson m. May 13, 1817, Flora McCampbell, and I think one of the above, probably dau. of Andrew McCampbell, who married Mary Anderson. Elizabeth Logan, b. January 10, 1775, daughter of James and Hannah (Irvine) Logan, m. September 1, 1801, James Allen, son of James Allen and Frances Erwin, his wife. She a daughter of Francis Erwin and Jene Curry. Francis Erwin was son of Edward Erwin, Sr., and Frances, his wife. Lavinia Allen, b. October 25, 1802, m. E. Fullenwider, died July 30, 1879. Melinda, bibecexnber 18, 1803, died April 17, 1804. Hannah Logan, b. December 19, 1806, m. first, Rev. Crawford; m. second, Rev. Samuel Taylor, died February 11, 1895. John Newton, b. March 8, 1808, died December 30, 1835. Dr. James Logan, b. October 9,1809, died September 29, 1858. Joseph and Jane, twins, b. July 11, 1811, Joseph died July 21, 1817, Jane died August 1, 1817. William Graham, b. June 1, 1813, died October 27, 1868. Archibald Cameron, b. March 4, 1815, died August 28, 1883. Robert Welsh, b. March 25, 1817, died July 29, 1882. Jacksonville, Ill. A son of Lavinia Fullenwider, Chalmers, lives at Crawfordsville. Charles Rice, a grandson of Narcissa (Allen) Rice, and son of James Rice, also lives in Crawfordsville. (a) Felicia Narcissa, b. Aug. 10, 1848. (b) Henry Clay, died in infancy. (c) Mary Miriam, b. Nov. 19, 1852, m. Rev. Charles Little, died 1874. (d) Margaret Rebecca, b. May 9, 1856. 1. Jerry Jr., b. Jan. 19, 1874, died Oct. 6, 1878, buried at Urumia, Persia. (a) John Maxwell, b. Nov. 19, 1902. (b) Helen Miriam, b. Mar. 20, 1906. (c) Philip Rice, b.Nov. 19, 1909. (d) Dorotha, b. June 18, 1911. (a) Robert Karl, b. May 14, 1907. (b) Edwin Oldfather, b. Oct. 15, 1910. (c) Pelicia Miriam, b. Nov. 29, 1914. (a) Margaret, b. Mar. 21, 1904. (b) Helen, b. Dec. 30, 1906, Munich, Germany. 5. Charles Harvey Oldfather, b. June 13, 1887, Tabriz, Persia. He is now Professor in Greek and Church History, Hanover, Ind., m.	Sept. 7, 1914, Margaret McLelland. "The Waveland Academy was located at Waveland, Montgomery County, Ind. It was incorporated Jan. 16, 1849, by William Graham Allen,* John Milligan, David Wills, James McCampbell, Harvey A. Adams, J. C. Eastman, Robert W. Allen,* Charles Thompson, Samuel N. Evans, Abraham Geltner, D. Fullenwider, Samuel D. Vance, Samuel Maxwell and Isaac Rice, Jr."* --Indiana Magazine of History. 1. Mary (or Polly), b. June 23, 1797, lived a long and useful life unmarried. Died in Waveland, Montgomery County, Indiana. Miriam married _____ and lives in Illinois. If living, she is the only one surviving. I. Rev. James Venable Logan, D. D., LL. D., the accomplished and scholarly President of Central University, Richmond, Ky.
Lillian. They live in Richmond, Ky., and he owns a fine farm on Silver Creek, Madison County. II. Elizabeth Lee Logan, m. Rev. L. L. Wood. One child, died in infancy. Both are dead. Dr. Robert A. Irvin, Clay City, Ky.
VIII. Agnetta Logan. Frances, Sally and Nettie live at 1123 West Main St., Shelbyville, Ky. Nettie has been an invalid a number of years from rheumatism. She took much interest when able, writing a history of our family, and to her I owe much for the help she gave me. (3) Joseph Lee, a lawyer, lives in Cincinnati, O. His daughter, Cora Lee, has spent much time tracing and writing family history. 5. Amzi Logan, b. Aug. 26, 1803, m. Jane Allenia daughter of Benjamin Allen, of Shelby County, Kentucky, and she was a niece of James Allen, who married his aunt, Elizabeth Logan). They located in Parke County, Indiana, in 1838. In 1845, moved to Clinton County, Indiana, where he died in 1846. His widow lived till 1877. Two children: Newton A. and Benjamin A. (j) Arthur lives in Michigantown, Ind., unmarried. 6. Asenith, b. June 17, 1805. Lived a long life unmarried. 7. Addison, b. March 6, 1807, married Catharine Hope in Ken- tucky, and moved to Parke County, Indiana. Later moved to Scotland County, near Memphis, Missouri. Both were living in 1888. (3) William Reynolds, married Alice Graves, of Audrian County, Mo. One son, William. He has a position in a bank at Mexico, Audrian County, Mo. He married a second time, Eliza Eubank, in Lincoln County, Mo. * James Hervey Logan at one time Judge of Santa Cruz County, Cal. He propagated the famous Loganberry. 9. Eliza, b. Jan. 8, 1811, died Oct. 11, 1841, unmarried. 10. Milton, b. Mar. 29, 1813, died, aged 4 months. 12. Julia L. and a twin sister b. June 22, 1813. [1816?] Twin sister died July 8, 1816, and Julia L. died Aug. 1, 1817. 13. Sarah Jane, b. Dec. 6, 1819, died Sept. 23, 1822. 14. Martha Ann, b. May 29, 1822, married _____ Hall, and lived at Alton, Ill.
Jane Logan died Aug. 14, 1846, and Alexander Logan died Sept. 26, 1847. Both are buried in the cemetery at Shelbyville, Ky.
1. Mary died, aged 13. 1. Nellie May, m. William Gardiner. 3. Harry, the oldest son, lives in San Antonio, Texas. 1. Susie A., b. Jan. 22, 1865. Susie A. Reid married Chester A. Binkley. 2. Margaret M., b. Apr. 22, 1866, d. Sept. 21, 1884. 3. Annie L., b. Dec. 1, 1867, died May 6, 1868. 4. Mary Jane, b. June 18, 1870. 5. Celesta, b. July 8, 1872, died May 6, 1895. 6. Luther S., b. Aug. 21, 1874. 7. Robert A., b. Dec. 12, 1876, died Aug. 21, 1898. 9. Infant, b. Feb. 6,1881. 10. Chester H., b. May 17, 1883. Charles A., born June 13, 1884, died March 21. 1905. William, b. Oct. 27, 1886, d. Feb. 20, 1889. Gracie S., b. June 9, 1889, m. Andrew Morrow. Jessie C., b. Feb. 27, 1892. James W., b. Sept. 25, 1895, d. Nov. 5, 1897. Mary V., b. Oct. 1898. Leola P., b. Apr. 22, 1905. Nellie May, b. Oct. 18, 1889, married J. N. Simmons. Mary Alma, b. July 22, 1891, died Feb. 7,1894. Josie Evaline, b. Jan. 31, 1894. Infant, b. May 4, 1895. Cecil M., b. Apr. 14, 1897. Ora Etta, b. Oct. 15, 1898. Gail Reid, b. Nov. 15, 1902. Lewis Alton, b. June 10, 1905. Edith L., b. Dec. 1, 1907. Joseph Clayton, b. Aug. 17, 1910. Luther S. Reid, married, first, Jessie Forister; one child, Albert; 2d, Florence Newbill. Chester H. married Emma Payne. Thank you for posting the "IDL" which has helped me fill in some gaps in my research. 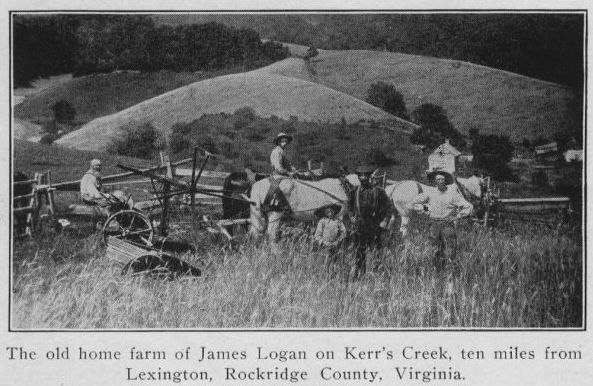 To my knowledge, I am not related to your family, although my ancestors also came from Rockbridge Co., Virginia, so who knows? My interest comes because I am a research assistant in the Department of Surgery at the Medical College of Ohio, and I am helping Dr. John Howard with a biography of Dr. Allen Oldfather Whipple. You may recogize Dr. Whipple's middle name, which was given in honor of his father's friend and fellow missionary in Persia, Rev. Jeremiah Oldfather, who married Felicia Narcissa Rice. 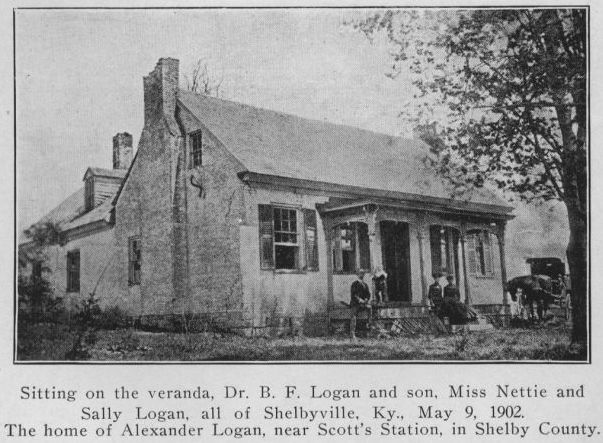 Like Felicia, Dr. Whipple was also a descendant of the Allens of Virginia and of Shelby Co., KY, being the grandson of Rev. William Youel Allen. I am writing to inform you of a correction that should be noted in the IDL. On page 64, in the list of the children of Felicia and Jeremiah Oldfather, it is stated that their third child, Helen Sidwell, married Rev. August Karl "Richardson." Helen's husband's surname was actually *Reischauer*. Possibly this name was not readable in the original records. This correction is especially important because August and Helen's son, Edwin O. Reischauer, had a distinguished career as a diplomat and scholar, and was the U.S. ambassador to Japan from 1961-1966. I have appended Britannica Online's article2 about him to this e-mail. Ambassador Reischauer's daughter, Mrs. Ann Heinemann, has been very helpful to Dr. Howard in his research on the missionary families of Urumiah, Persia. I would be happy to share additional information on this branch of the family if you are interested in adding it to your web site. 2"Edwin O. Reischauer" at Encyclopædia Britannica: https://www.britannica.com/biography/Edwin-O-Reischauer. Wikipedia provides another good biography. Another biography was formerly available at the Edwin O. Reischauer Institute of Japanese Studies site. Ambassador Reischauer is my seventh cousin! This page was last updated 3 May 2017.